My first memory is of my brother. Seeing his head bobbing along in front of me as I chased him down our street, calling after him to wait for me. And he'd turn around and grin, his baby teeth smooth as pearls. "Com on, Wing!" he'd say to me, his little sister. I would have followed him anywhere. Jandy Nelson meets Friday Night Lights: a sweeping story about love and family from an exceptional new voice in YA. With a grandmother from China and another from Ghana, fifteen-year-old Wing Jones is often caught between worlds. But when tragedy strikes, Wing discovers a talent for running she never knew she had. Wing's speed could bring her family everything it needs. It could also stop Wing getting the one thing she wants. I'd heard about this book and I'd followed Katherine on Twitter, with a keen interest. There was a lot of buzz about this book, but I don't really let the buzz influence me too much. But when the cover was revealed at YALC, I knew I had to read this book. The cover is TO DIE FOR! I mean, seriously, it is stunning and I love it so much more than the American version. I swear book covers call to me, and this one demanded I read this book. There is something magical about the cover that also exists within the stunning writing. I was easily swept up in the beautifully told story, oozing with first love, family bonds, strong women and perseverance. It's the type of book you can quote from, because the words flow so easily together and are full of meaning. You can easily relate them to your life. Wing is one of the most powerful diverse female characters I've come across in a long while. From the very first chapter, you know she has something special about her. Sheer determination literally flows from her trainers. She will not be sidelined and will stop at nothing to save her family. She is one my most favourite female characters of the year, standing shoulder to shoulder with Amani from Rebels of the Sands by Alwyn Hamilton. Wing is surrounded by strong women. Her grandmother's Lao Lao and Granny Dee are like warriors, fighting against their age to help make things better. Her mother works so hard, desperate to bring their life back to normality. Even her brother's girlfriend, Monica, defies her family to be with the one she loves, standing up for what she truly believes in. People are comparing Webber's writing to Jandy Nelson, but for me, the strong female bonds reminded me of such classic films as Steel Magnolias and How To Make An American Quilt. This book has touches of magical realism, which is something I utterly adore. I'm assuming that the dragon and the lioness are strong symbols representing her mixed heritage, urging her to become the person she needs to be. This debut is stunning. You come away from it feeling hopeful that you can conquer your own fears and obstacles. Just by believing in ourselves and persevering, we can reach our dreams. We are strong and more than capable. I love it so much. It's the book I will be shouting about from the rooftops. 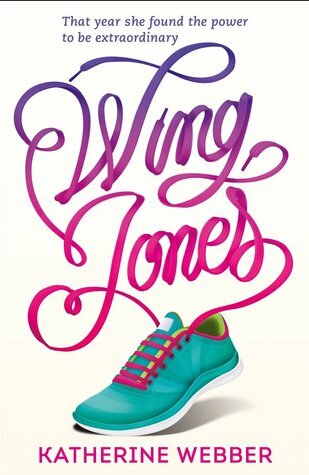 I won't be surprised if Wing Jones wins awards over the next year or two. Congratulations Katherine Webber, on such an outstanding debut.